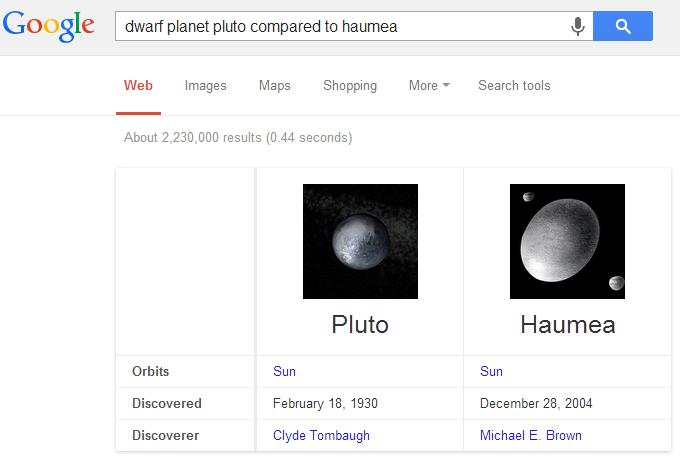 I noticed the other day that it’s now possible to compare different planets, moons and dwarf planets when searching in Google. I’m not sure how long this has been around or if it’s a new feature or not but I haven’t seen anyone else mention it. I’ve experimented with a couple of searches and recorded what queries I was able to find that return the comparisons, as well a few issues I spotted with these results as they are. 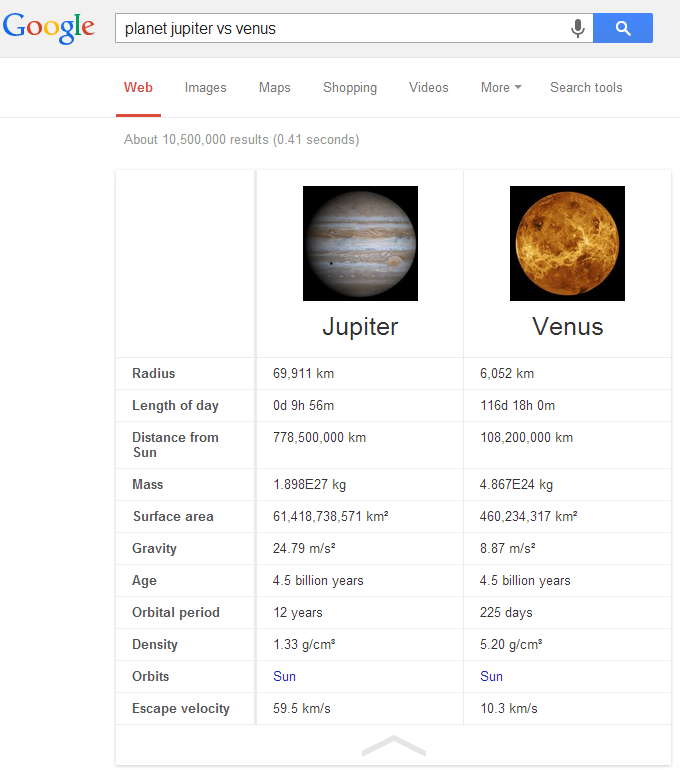 There’s a couple of different ways to bring the comparison as seen in the images below by using the words “compar(ed)” and “vs” in your search, the following searches all return a comparison: “compare Mars and Venus”, “Saturn compared to Neptune” and “Uranus vs Jupiter”. Sometimes “planet” needs to be added into the search query e.g. “Mars vs Venus” doesn’t bring up a comparison but “planet Mars vs Venus” does. 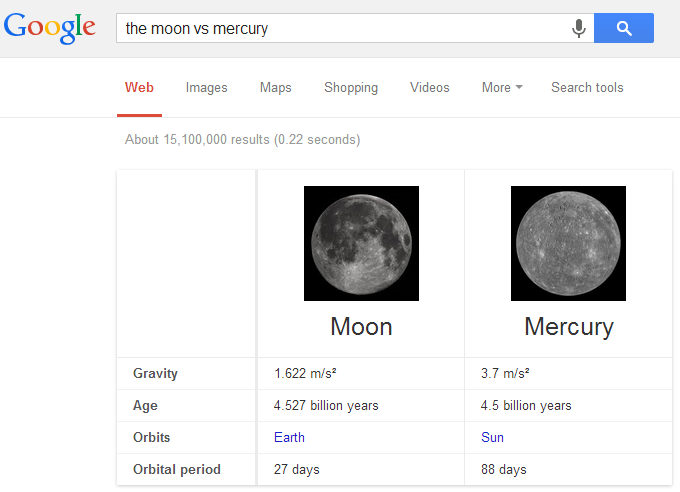 Moons can also be compared, using search queries in much the same as with the planets e.g. “compare Europa and Titan”. As with the planets sometimes “moons” needs to be added to the seach query e.g. “Io compared to Triton moons” brings up a comparison but “Io compared to Triton” does not. The one other astronomical object I’ve found that can be compared are the dwarf planets but there’s a lot less information displayed than when comparing planets and moons. All the Planets, Dwarf Planets and Moons can be compared against each other using searches along the lines of “dwarf planet Ceres vs Mercury” and “Jupiter compared to the Moon”. I haven’t found queries that bring the Sun and Stars up in comparisons and some of the other comparisons seem a little temperamental, for example I was unable to compare Mercury and Pluto but was able to compare Mercury and Ceres. At the moment it also only seems to be possible to compare two objects at the time but I wouldn’t be surprised if at some point you would be able to compare more. I assume all this information is being taken from Wikipedia as that’s where Google seems to pull a large amount of its knowledge graph data but the lack of a source in the comparison is a bit disappointing. 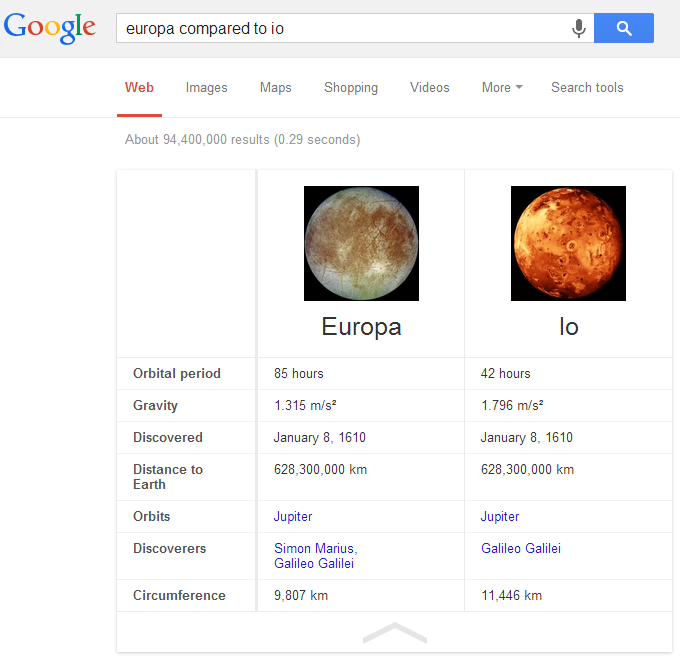 Has anyone else spotted any astronomy related comparisons that bring up a special result in Google? dose Pluto have 1 or 3 moon because on some site i look at they say there is 1 moon others say there are 3 moons.